Online Appointment Management brings tangible benefits to an organisation. It improves the customer experience as well as the operational efficieny. Ease of access: Ease of access means that customers easily can find you and book a meeting with you – through a laptop, tablet or smartphone. Improved customer experience relates to increased customer retention. Saves time: A customer can make an appointment with you just within a few minutes from the comfort of their home or workplace. Improved efficiency: With an appointment management system it is possible to even out customer flow, to match service request with the right resource and utilize staff in a more efficient way. Anytime - Anywhere: In an online appointment system a customer can make an appointment any time, just like as if you are providing 24x7 services. 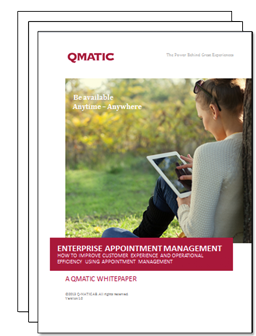 Read our comprehensive white paper on Enterprise Appointment Management; the challenges and opportunities and learn how you can optimize the customer journey. "A 2% increase in customer retention has the same effect as decreasing cost with 10%."